​Welcome to Sally Rowe Quilts: Art Quilts for the home and corporate settings. One-of-a-kind and Commissioned work. "During my years of quilting, the West Virginia mountains and woodlands have inspired a series of quilts depicting the natural beauty of the scenery. 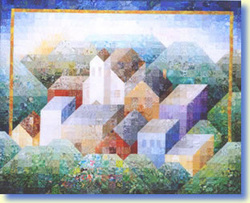 This work represents the heart of many small towns nestled in these mountains. The idealized and feel-good color scheme represents the joy and simplicity of life here. Using swatches of fabric the way a painter uses dots of paint, I try to manipulate the color values to enhance natural shapes and impart some perspective to the scene without abandoning the traditional methods of quiltmaking."